Saturday Storytime - in the children's section of the library! Master Gardener Series: Veggies, Flowers, and Grass, Oh My! Dark, winter months got you feeling down? Come brighten your day with a little “art therapy,” and use creativity as your outlet for stress! Experiment with a variety of art supplies, and make a project to take home. Materials provided. Ages 18 and up. No registration required. The Charlotte Hall Book Discussion Group will discuss The Joy Luck Club by Amy Tan. Copies of the book are available for checkout prior to the discussion. New members are always welcome! Stories, rhymes, bounces, songs, and playtime for children birth-2 years with their adult caregivers. Siblings welcome. LifeStyles of Maryland, Inc. will help you file your 2018 federal and state income taxes at no cost. Only available to qualified individuals with an annual income of less than $55,000. Appointments available from 9:30 a.m. to 5:00 p.m. Call the Lexington Park Library at 301-863-8188 (press 3) to schedule an appointment. Stories, rhymes, songs, and activities for children ages 1-3 with their adult caregivers. Siblings welcome. A storytime where sitting is optional, and activities are designed for kids with extra energy. Planned with ages 1-5 in mind; all ages welcome with their adult caregivers. Have questions about growing vegetables, soil conditions, mystery insects,invasive weeds, or heirloom plants? Ask a Master Gardener at this free plant clinic. Stop by the table in the library lobby with your plant samples and questions. Drop-In Tech Help is open for any and all basic technology questions! We'll do our best to assist you in a relaxed, low-stress environment. Learn how to download eBooks and eAudiobooks to your phone or tablet. Learn how to navigate the internet, email, and social networks. Learn how to connect devices to a network, Bluetooth, or the cloud. Using technology effectively is right at your fingertips! Job seekers can stop by to get job counseling and resume help,search for jobs, and get registered with the Maryland Workforce Exchange. Stories, rhymes, bounces, songs, and playtime for children birth-2yrs old with their adult caregivers. Siblings welcome. Chillax at the Lex is a time set aside for kids ages 8 – 13 on the 1st and 2nd Thursday of each month. We switch it up with Games, crafts, and activities. Walk ins welcome, we'd love to have you drop in! THIS WEEK: Squeezing a small ball can squeeze away your stress and help you pay attention to other things. Come in and make your own stress ball. A reading and discussion series for veterans led at the Lexington Park Library by Vietnam veteran, author, and retired College of Southern Maryland professor, Wayne Karlin. Service members of all eras, and their spouses, are welcome. Participants should plan to attend all sessions. Free. Lunch and materials provided. Registration required by Friday, January 26th. To register contact Cecelia Thomas at 301-863-8188, ext 2008 or email cthomas@stmalib.org. The Veterans’ Book Group is coordinated statewide by Maryland Humanities and presented locally in partnership with St. Mary’s County Library. The program was created by the Maine Humanities Council to promote understanding of the military experience and to support returning veterans. Stories, rhymes, songs, and activities planned with ages 1-5 in mind; all ages welcome with their adult caregivers. Join us as Ginamarie DeMilio, Professional Etiquette Instructor, discusses the best way to promote a positive professional image. She will talk about personal appearance with regard to clothing, grooming, personal behavior, manners and etiquette, and communicating effectiveness. Ms. DeMilio's goal is to help attendees gain the confidence necessary to join the workforce and leave a lasting, positive image with potential employers. Job seekers can stop by to get job counseling and resume help, search for jobs, and get registered with the Maryland Workforce Exchange. Enjoy games of all sizes, from card games and jigsaw puzzles to a giant version of memory! Designed for teens living on the spectrum. There will be scheduled breaks, an area to chill out, and fidgets readily available. Caregivers welcome, but not required to stay. Registration required. Contact Elizabeth Davis at edavis@stmalib.org for questions. Whether you have been stitching for years, or you just want to learn, join fellow crafters who love all things fabric and fiber. Open to knitters, crocheters, quilters, embroiderers, cross-stitchers, and any other kind of needleworkers. Bring your current project, mingle with like-minded makers, and swap patterns, ideas, and tips. Basic supplies available, if needed. All skill levels welcome. No registration required. This presentation will give you a basic overview on financial advisors. The workshop will answer questions about how to find and work with an investment professional, what are the various types of advisors, interviewing and working with a financial advisor. In addition to learning about advisors, you will learn about BrokerCheck by FINRA. BrokerCheck is a free tool that shows you employment history, certifications, licenses, and any violations for brokers and investment advisors. FINRA (Financial Industry Regulatory Authority, Inc.) is dedicated to investor protection and market integrity. It regulates brokerage firms doing business with the public. A representative from Walden will be in the foyer to talk about behavioral health & wellness. Activities provided, games, crafts may be provided. Drop in and explore virtual reality in seated and standing experiences with Oculus Rift and Google Expeditions! All ages are welcome. We encourage everyone in the family to join us for this awesome event! Chillax at the Lex is a time set aside for kids ages 8 – 13 on the 1st and 2nd Thursday of each month. We switch it up with Games, crafts, and activities. Walk ins welcome, we'd love to have you drop in! THIS WEEK: Try out Oculus Rift VIRTUAL REALITY GLASSES! We'll have Wii & laptop computers to play too, all in our talking zone meeting room. For beginning readers, or any student who needs a confidence boost. Join "Pets on Wheels" to practice reading out loud to a therapy dog for 15 minute sessions. Registration opens 2 weeks before each program. Readers should bring a book, or arrive at least 20 minutes early for help to choose a book. The Southern Maryland Math Circle provides fun, fascinating math activities to middle- and high-school students (and their families!) Run by the faculty at St. Mary's College of Maryland, this monthly gathering is sure to inspire a love of mathematical exploration to everyone who comes. Snacks will be provided. No registration required. Freshen up your doorway this spring with a DIY ribbon wreath! All materials are included. Ages 18 and up. Registration required. This event has been rescheduled for April 27. Join us for storytime at Historic St. Mary's City. There will be stories, activities, songs, and more intended for children 1-5 with their adult caregivers. Storytime will be at the State House Bluff, feel free to bring a blanket to sit on. Siblings welcome; no registration required. MAGIC’s Capture the Flag is an ethical hacking cybersecurity competition for entry-level participants at the high school and college level. No prior experience is required and the event is free for participants. 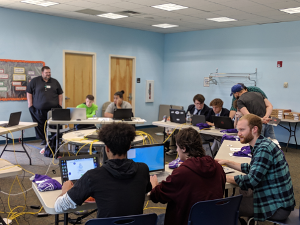 MAGIC’s CTF will feature teams of 2-4 students working their way through a series of cybersecurity puzzles set up in a “jeopardy” style format to find hidden flags to earn points. Coaches will be on site to help students if needed. Bring your laptop if you have one! We will have some extras if needed. Check-in begins at 11 a.m. and the event begins at 12 noon. Arrive before noon to try out the Oculus Rift VR system! This event is currently full. Please email Amy Rupp at arupp@magicinc.org with your name, email, and location name (St. Mary’s County Library) to be added to the wait list. Build skyscrapers, bridges, and domes out of sweet treats! With grapes, marshmallows, and rice crispy treats you can build the most amazing feats of engineering you can imagine. Designed with ages 6-12 in mind. Something strange is going on at the Lexington Park Library. We’re hosting a Stranger Things party and paying homage to all things ‘80s. Bring back that retro vibe by foraging through your local thrift shop for ‘80s clothing and memorabilia, and arrive dressed in costume to receive a small prize. And, no Stranger Things party would be complete without waffles, ‘80s inspired snacks, Dungeons & Dragons, a mystery to solve, a killer photo booth, and trivia. All ages are welcome. But, please remember Stranger Things is full of spooky, creepy fun, and it may be too scary for little ones. Bring your gardening notebooks. Master Gardeners will discuss planning and designing your garden, choosing the right plants for sun and shade, deciding on the best grass for your property, and choosing plants native to your region which will adapt to our climate, soil and native pollinators. Avast me hearties! It's a family program inspired by knights, ladies, and the high seas. There will be a variety of games and activities for fair maidens, brave squires, and fearless sea captains of all ages. Costumes encouraged! No registration. A representative from Walden will be in the foyer to talk about behavioral health and wellness. Feeling lost in today's media landscape? Join Newseum Education as they tackle buzzwords, bots, and bad actors on social media. In 90 minutes, you'll get clear definitions of current media terms, practical tools to identify fake and flawed news, and practice with real examples. Registration required. The Dept. of Aging and Human Services will be in the foyer to talk about services and upcoming programs for seniors. Teen Action Group meeting. Take a leadership role in creating and assist with library events. Earn volunteer hours too! Walk-ins welcome. ESCAPE FROM THE KITCHEN! Are you clever enough to find your way out? Solve clues and crack codes to see if you can make it out of the 'Kitchen' in 30 minutes. Open for teens and tweens ages 12 to 18. (Three start times available: 5:00, 5:45, 6:30.) Register here for 5:45 start time. Use common straws and special connectors to build a three dimensional grid that grows! Create a structure from lines, shapes and forms that can grow taller than you. This program will help children explore science, technology, engineering, arts and mathematics using accessible design, especially those with visual disabilities. Presented by the Maryland State Library for the Blind and Physically Handicapped & FutureMakers, this event is open to all families with children from ages 5-10 (with or without special needs). Please register. If you have a craft project you're working on and would love some company, come to the library and join other crafters. The Library is closed for Easter Sunday. Grab a bite and gab about books! Join us at Taphouse 1637 in California for a relaxed conversation about what you've been reading. Share what you loved (or loathed) about the last book you read, gather new recommendations from the rest of the group, and enjoy the company of fellow bibliophiles. Visit taphouse1637.com for directions and to see menu options available for purchase. Adults only. No registration. Join us on an art adventure! We will explore the world of art through various forms. Please expect and prepare for messy activities. Ages 6 months - 4 years old. A storytime designed for a smaller group, but still filled with lots of fun. If your little one finds our regular storytimes a little too overwhelming then this may be more their style. Designed for ages 2-5 with their caregivers. Registration required. Come together and learn with local and aspiring authors. Spend the day discovering new authors and learning how to get started in the writing industry. Authors include: Simons Acquah, Theresa Ford, Jennifer Foxworthy, Angela Harris, Nilma Jayaraman, Judy Kelly, Gary Knight, Yvonne Medley, JR Rhine, and Leonard Wathen. No registration required. Join us for storytime at Historic St. Mary's City. There will be stories, activities, songs, and more intended for children 1-5 with their adult caregivers. Storytime will be at the State House Bluff, feel free to bring a blanket to sit on. Siblings welcome; no registration required. Have you ever wanted to write a book but thought it might be too hard or too expensive to publish? Now there is an easy way to self-publish using a FREE website. Explore easy steps to upload your book file, design a colorful book cover, get an ISBN, revise, order books, upload to Amazon, select sales channels, and upload for Kindle. Presented by Cindy Freland. Registration required. Have a say in what happens at your library. Meet with other teens, and take a leadership role in planning exciting library programs. Snacks and service hours provided. Walk-ins welcome. The most widely used independent investment information service. It is a comprehensive source of information and advice on approximately 1,700 stocks, more than 90 industries, the stock market, and the economy. The Library currently subscribes to Value Line as an online database. This demonstration will help users learn how to best navigate the Value Line Library Elite digital platform. We will discuss some of the most popular features of our digital investment research platform. Tutorial tips will be given on how to quickly look up a stock report in the Value Line database, how to read a value line report, how to modify and print company report modules. The workshop will include a demonstration on how to access popular platform features such as the Value Line Selection & Opinion newsletter and historical company reports.